This pendant will update your home with its eye-catching design. Featuring a chrome finish and chrome and crystal shade(s), this fixture will accommodate a variety of dicor styles. With its easy installation and low upkeep requirements, this pendant will not disappoint. This box shaped 4 light pendant with geometric patterns fits both modern and contemporary spaces. The Oil Rubbed bronze finish with this design is suitable for foyers, dining areas and kitchens. Add filament style bulbs to this framework for lofts and industrial style spaces as it is a good source of light. Modern geometric pendant with antique silver leaf finish. Perfect focal point for any space. Matching canopy included. The E12 bulb base gives you a very broad choice in bulb styles to choose from. 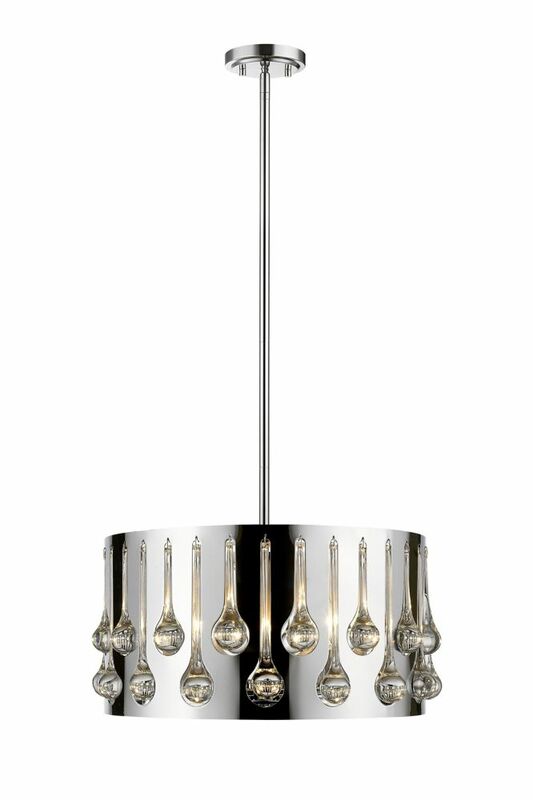 Modernistic elegance defines this beautifully crafted 6-light pendant. The distinctive curvature formations of the crystal glass, supported by a chrome-finished hexagonal frame, allows this pendant to disperse an expansive light within any room in your home or office. Combining visual magnificance with contemporary aesthetics, this fixture is perfect for those wanting something different than the traditional pendants. Hardware is included for easy installation. Overbrook four-light pendant features a scrolling frame in Silver Ridge finish surrounding a sailcloth textured drum shade in a Natural Linen finish. Etched glass diffuser on bottom to provide even diffused light. An elegant fixture that will enhance various living areas of your home. 4-Light Chrome Pendant with Chrome and Crystal and Steel Shade - 17 inch This pendant will update your home with its eye-catching design. Featuring a chrome finish and chrome and crystal shade(s), this fixture will accommodate a variety of dicor styles. With its easy installation and low upkeep requirements, this pendant will not disappoint.